Brushes…the one thing that everyone who does make up uses. Like make up, there are good brushes and there are bad brushes, there are expensive brushes and there are cheap brushes. A very common misconception in make up is that if something is expensive then it’s bound to be brilliant and better than the cheaper versions, but that is so wrong. Yes, some of the more expensive Brands are good, but then there are a lot of brilliant Drugstore Brands that perform just as well, if not better, than some of their high priced competitors. One of the best Drugstore Brands is MUA (Make Up Academy). The Brand itself is nearly 4 years old and, in that time, it has grown and gone from strength to strength and is continuing to grow on a daily basis. 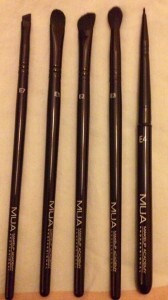 MUA offer a large range of products, with new lines being added all the time. Their prices range from just £1 up to £8 (which is their 24 Colour Immaculate Collection eye shadow palette and their new Pretty Edgy Luxe Palette). Last year MUA expanded their range to offer a selection of Brushes.. You’d be forgiven for thinking that, for £1.50, these brushes aren’t going to be much good. I’ll admit that I was expecting something that looked and felt cheap and was also expecting a lot of shedding from the bristles at the first sign of work and complete destruction upon washing. I’ve been using MUA products for over 3 years now and I have always been pleasantly surprised by all of the new ranges, but I really was skeptical about the brushes. I have used all manner of brushes in the past, ranging from the high priced ones, right through to a generic, brand-less set that I found on eBay for £14 (which actually turned out to be one of my best bargains!). I have experienced the good brushes, but I have also experienced the very, very bad brushes. I decided that I would buy some brushes from MUA, after all, even if they turned out to be no good, it’s not like I would have spent £15 per brush or anything silly like that. When my order arrived, I have to say that I was really impressed. The brushes were packaged in their individual plastic wallet and have cellophane around the bristles to keep the shape. However, it was the brushes themselves that really caught my attention. As I said above, I was expecting something that felt and looked cheap, but these brushes are neither. 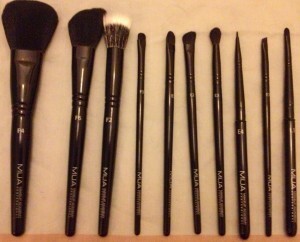 They all have sleek, black handles with MUA’s logo embossed on them, together with their brush number (e.g. : F4, E2, L1, etc. ), the ferrule is shiny, black metal and the bristles are black, synthetic fibre. The only exception is the stippling brush, which is designed to look like badger hair, and is a “salt and pepper” colour with a white tip. None of these brushes feel cheap to hold and the bristles are amazingly soft; even the likes of the eyeliner brush and the eyebrow brush that, although firmer than the likes of the blending brush, are still so soft. MUA currently have 14 brushes in the range, out of which I have 11 (though have not mentioned the Kabuki Brush in this post). I did think about ordering the other 3, but I know I wouldn’t use them, so thought it better to save my money for something I would use. The brushes that I have (see above) are the ones that I think essential to anyone who does make up, whether as a Make Up Artist, or just for themselves. Before I go into the breakdown for each brush I just have to say that, like make up, there are no set rules for brush use. Just because a brush is expected to be used on the eyes for example, it doesn’t mean that it can’t be used for something else – as with make up, just because a lip-gloss is designed for use on the mouth, it doesn’t mean that you can’t experiment and use it on the cheeks or eyes. Make up is all about experimentation and finding what works best for you. That is the beauty of MUA products – they are all cheap enough that you can afford to experiment without breaking the bank but, at the same time, they perform just as well as the high end Brands, so you can still achieve the same results, just at a fraction of the cost. I am now going to do a breakdown about the particular brushes I have and what I use them for on a day to day basis but, like I said above, it doesn’t mean that this is what you have to use them for – dare to experiment and push the boundaries. The first set of brushes I will talk about are my essential face brushes. I have 2 of these brushes and I use 1 for applying my powder and the other for applying my blusher. I love the size of this brush; it is large enough that it covers a good area of skin in one sweep, but it is not too large so that (when applying blusher) you end up with an out of control flush of colour. It’s a great brush for people experimenting with product placement and pros alike. Like the Powder Brush, I have 2 of these. I use 1 for my contouring (using MUA’s Bronzed Perfection) and the other I use for my highlight (using MUA’s Undress Your Skin Highlighting Powder or their Shimmer Kisses Bronzer). This brush is by far the best face contour brush that I have used. I used to use a contour brush but found it too soft and it didn’t fit to the contours very well and I ended up not using one for years. I decided to purchase the MUA one to see how it went and I loved it (which is why I ordered another). Although the bristles on this brush feel very soft, they are dense enough that they don’t splay out on contact with the face, and the head is small enough that the bristles nestle nicely under the cheekbones and make following your natural contour a breeze. It also performs just as well for sweeping a highlight across the top of your cheekbones, down your nose and anywhere else you may want to highlight. All in all, a good brush, especially for people unsure on how to find/follow their natural contour. This brush will do the work for you with little effort but maximum satisfaction. I love stippling brushes and this one is no exception. I love how they can create the look of perfect, smooth, dream skin. I start by applying my foundation to the back of my hand and then dip the bristles of the brush into the foundation. I stipple any excess of onto my hand and then start to apply it to the face. I stipple over the area(s) that I want to cover and then, when that is done, using the same brush and whatever product is left on it, buff into the skin in circular motions. I then, if needed, go back and build my coverage in the same manner. I will say that this sort of brush can take some getting used to, especially if you are used to using a flat foundation brush or a sponge. Initially I wasn’t over keen on stippling brushes but, after more practice and finding a technique that suited me, the results were well worth it. I love this little brush. I use concealer every time I wear make up, even if I am using a BB Cream, especially around my eyes. My favourite concealer is MUA’s Cover & Conceal but, every now and then, I still get the “concealer lines” under the eye – you know, where the product sits in the creases of your eyes and looks awful. Since using this brush I have noticed that frequency in which the lines appear is significantly reduced and, in fact, the concealer blends in a lot nicer and the “cakey” appearance that can sometimes happen, especially after powdering, has also reduced. It is a smart little brush and is well worth the £1.95 price tag. Now, the brushes that can really make or break a look; the eye brushes. Regardless of whether you apply your foundation and concealer with a brush, a sponge or even your fingers, I am 95% certain that you use, at least, 1 eye brush (other than your mascara wand). It doesn’t matter how expensive (or cheap) a product is, I really believe that the right brush makes all the difference. These are my must have eye brushes. I couldn’t have put it better myself. This brush is my ultimate must have. For someone who has non-existent eyebrows, I always fill in my brows using pencil, shadow or a combination of the 2 but, whichever method I use, I always use an eyebrow brush. This brush has such a fine, sharp edge which enables the most perfect of lines when defining brows. You can use it for the “hair stroke” effect, for defining the brow lines, for filling the brow or for smudging product through the brow. I have had more compliments on my brows since I started using this brush than at any other time. 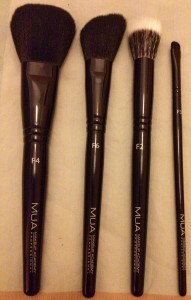 I also have another of these brushes which, like MUA say, I use for lining the top/bottom lashes. I do use an eyeliner brush when working with gels/creams but, when I am using a shadow as a liner or just to add that little extra definition when I don’t want the hardness of a liner, this is the brush I turn to. I use it either to push the shadow on, to draw the shadow on or to smudge the shadow line. It is one of the most versatile brushes in the collection and, for £1.50, I think it is one that everyone should have at least 1 of. This is a really lovely brush. It is so soft and doesn’t drag at the delicate skin of the eyes at all. It can be used to press colour onto the eyes or to sweep it across the lid too. It picks up a good amount of product and performs consistently well with both pressed shadows and pigments. It also works well with cosmetic glitter. This is definitely a brush that everyone needs in their collection, as it is the staple brush to have when applying eyeshadows. It’s non-shedding and is a dream to clean either with a spot brush cleaner or when doing the deep clean wash.
*Sometimes referred to as a flat eyeshadow brush or flat, round eyeshadow brush. Another bargain brush from MUA. This is the brush I use to apply colour into the crease of my eye and to start the smudging and blending. It is perfect for following the contour of your eye and would be great for people who are trying out new eye looks and experimenting with product placement. With this brush you don’t need to try to find you eye’s natural contour, the brush does the work for you. It is best used with a light touch as then it glides effortlessly over the lid and smoothes colour onto the eye without damaging the delicate skin. The Don of the eye make up world, the brush that is a Make Up Artist’s Best Friend and the brush that everyone needs in their collection. This is the brush that makes an eye look come together. It is used for blending your colours together, softening edges/hard lines, etc. It can also be used for applying shadows for a much softer finish. I wouldn’t be without this brush (I have 5 from MUA in my collection and at least another 10 from varying brands). MUA’s version of this brush is perfect. The bristles appear long, but they are dense enough that they do their job brilliantly. Like the other brushes, the bristles are very soft so you hardly feel them against your skin. I have used this brush both for blending looks together and for applying shadows for a softer look and it performs consistently every time. It holds its shape well when blending and doesn’t fan out, which can ruin the look. This brush requires very little pressure on it and works well either in small, circular motions for blending, side to side or smudging upwards. Definitely a steal at £1.95; I would have paid much more for this brush. Do not be fooled by the price, it in no way reflects the quality. I love this little brush. I love that fact that it is compact and can be stored within itself for space saving/travel and that, unlike a lot of other compact brushes, it doesn’t feel flimsy or like it will come apart when stored or when in use. The tip of this brush is ultra-fine. I couldn’t get a clear enough picture to illustrate just how fine it is, but it really is perfect. It applies gel/cream liners with ease and in such a smooth, fine line. The fact that tip is tapered means that it allows for a precision fine line, but also handles the thicker lines just as well, while keeping them looking neat and professional. 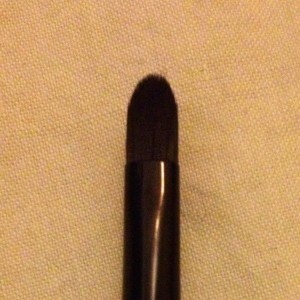 It holds its shape during application and doesn’t bend from the ferrule like some eyeliner brushes can. If you love your eyeliner then this is definitely the brush for you! I rarely use lip brushes for personal use however, since purchasing MUA’s Lip Trios, my need for a lip brush increased and so I purchased this one. I have used lip brushes before but have found them really rigid and they tended to push the colour around the mouth rather than actually place the colour. When on jobs I use disposable lip brushes and, to be honest, I find them too soft and flimsy, especially when trying to achieve that perfectly defined lip line so I wasn’t altogether sure what to expect from this brush. Apart from looking like a much more expensive brush and having the compact feature in its favour, I immediately liked the shape of the tip itself. Like the other MUA brushes the bristles are soft, which lead me to think that it would behave like one of the disposable brushes. I was so wrong. It holds its shape perfectly and creates the sharpest and most defined lip line when working with balms, glosses or cream products but, at the same time, it deposits the colour on to your lips, rather than push it around or leave brush lines. I’m so happy with this brush that I will be ordering more to take on jobs with me, even if it does mean that I have more brushes to wash when I get home, this one is definitely a keeper. In conclusion, these brushes are brilliant and in NO way does the price reflect the quality or performance. I am proud to tell my Clients that I am using MUA brushes/products on them and I am always amused by their reactions when they find out how little the products actually cost. MUA makes experimenting with make up both fun and affordable. If you’ve been thinking about buying some new make up brushes and weren’t sure which to get I hope that you have found this blog useful or even if you have brushes and weren’t entirely sure on the best way to use them. All of the views expressed within this post are mine and mine alone. I am in no way affiliated or financially involved with MUA, fbBeauty or any of their employees. All of the products mentioned within this post were bought and paid for by me.